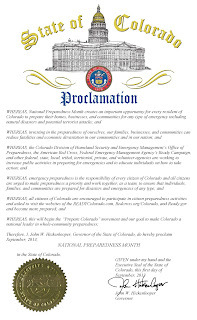 Governor Hickenlooper has declared September National Preparedness Month in Colorado. September will also launch a statewide movement dubbed "Prepare Colorado" to make Colorado the most prepared state in the nation. At 2 p.m., Friday, Sept. 6, on the steps of the State Capitol in Denver, Colorado Lt. Governor Joe Garcia will join regional leaders from the American Red Cross and the Colorado Division of Homeland Security and Emergency Management in announcing a statewide “Prepare Colorado” movement intended to save lives, reduce suffering in the face of emergencies and improve our communities’ ability to bounce back from disasters. Red Cross and its partners at the State of Colorado will make a call for all sectors of our community – public, private and nonprofit – to commit to taking specific actions to increase the preparedness and disaster resiliency of individuals, households, schools, businesses, organizations and governmental agencies in Colorado. Each week in September, the Red Cross, Colorado Division of Homeland Security and Emergency Management and FEMA Region VIII are encouraging Colorado residents to take specific actions to build their “Game Plan” for disasters and emergencies. People are encouraged to download the Game Plan checklist from www.redcross.org/Colorado and submit photos of themselves completing the tasks for a chance to win a solar- and crank-powered weather radio that can also charge a cell phone. Sept. 1-7: Make sure you have access to critical data in time of emergency. Register on ReadyColorado.com, where you can create, edit and save your emergency plan throughout the month and access it anywhere securely. Locate and make copies of all your important documents. Save a digital copy on a flash drive or on a secure remote e-server. Sign up for emergency alerts from your local emergency agency by visiting http://www.coemergency.com/p/local-info-sources.html and download Red Cross apps for your smart phone at redcross.org/prepare/mobile-apps. Sept. 8–14: Stay Connected: Know how you’ll stay in touch with loved ones when disaster strikes. Establish an out-of-town emergency contact. Discuss with loved ones how you’ll communicate with each other during a disaster. Set up the automatic “I’m Safe” feature in your Red Cross app to notify loved ones with one-touch. Build your 72-hour kit—advice for contents here: redcross.org/prepare. Get an emergency radio so you can stay updated if the power is out. Establish emergency meet-up locations: near your home for small disasters; outside your neighborhood for a large-scale evacuation; and outside your workplace/school. Map at least two routes to get you to your meet-up locations. Sept. 29–30: Practice your Plan! Practice evacuating to one of your emergency meet-up points and walk through your emergency plan with coworkers, family or neighbors. “Check in” at your evacuation point on social media and use hashtag #GamePlan. For more information, to download the checklist and Game Plan whiteboards, and to learn how to participate for a chance to win a weather radio, visit www.redcross.org/news/event/National-Preparedness-Month---Colorado.